BOURQUE, ANDRÉ-T. (baptized André), Holy Cross father, musician, composer, and author; b. 27 July 1854 in Beaumont, N.B., son of Thaddée Bourque, a farmer, and Anne Bourque; d. 28 June 1914 in Memramcook, N.B. André-T. Bourque attended the small school in Beaumont until, at the age of 11, he enrolled in the College of St Joseph in Memramcook, which had recently been opened by Father Camille Lefebvre*. He did the classical program there and received a sound musical education. When he left the college in 1873, he began to study medicine, but the following year he went to teach in the district of Clare, N.S. His reputation as a musician had preceded him, with the result that he was also offered the position of organist and choir master at Sainte-Marie church in Church Point. Bourque’s enthusiasm did not stop there, for he soon organized a band in the region. In 1880, in the middle of the school year, Bourque decided to enter the noviciate of the Holy Cross Fathers in Saint-Laurent, near Montreal. Having taken his vows, he returned to Memramcook in 1881, completed his theological education there, and was ordained to the priesthood on 3 June 1884. While studying, he had taken on a rather demanding assignment as music teacher and bandmaster at the College of St Joseph and as parish organist. For nine years Bourque would make his mark on the musical scene through his courses and his dynamic and superb participation in all the cultural events at his college. The newspapers of the day made a point of highlighting his contribution. Bourque’s stay at Memramcook also enabled him to display his talents as a composer. Le Moniteur acadien in particular mentioned some of his early compositions for choir or band, but nothing has survived except the cantata for the college’s silver jubilee in 1889, a composition published by Israël-J.-D. Landry*. The 25th anniversary festivities were just over when Father Bourque was appointed musician at the Collège de Saint-Laurent. He would remain there only two years, but his stay would lead him to take the rather surprising decision to become a missionary in the eastern part of India. The Congregation of Holy Cross was then carrying on a ministry in several villages in Bengal, where conditions – especially the climate – were not exactly conducive to replacing or increasing staff. Faced with the community’s need, Father Bourque went to join the team already there. He worked for six years (1891–96) in the mission at Solepore (Bangladesh), but left few written records of his various occupations, apart from the travel notes he had promised to Le Moniteur acadien, which he sent at the very beginning of his sojourn in eastern India. However, articles by colleagues shed light on some of his activities. It was reported, for instance, that he taught young boys to sing exceptionally well. Long after his stay in Solepore, villagers would recall “that he played the violin marvellously well,” and they were still singing a hymn he had composed. On his way back from Bengal, Bourque spent several months in France to regain his health, which had somewhat deteriorated. When he reached Memramcook in the summer of 1897, his former position as music teacher was held by a colleague. Bourque taught various subjects, but he relived his missionary experience by giving lectures on the customs of the Bengali people. After three years, Acadia apparently had become too confining for a man who had traversed land and sea and who doubtless missed the musical activities of the 1880s which had always put him in the limelight. January 1901 found him in Tacoma, Wash. From there he obtained a dispensation from his vows, and as a secular priest he carried out a ministry among Americans. 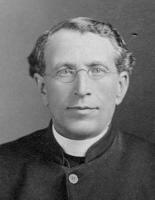 In August 1910 Father Bourque moved to a new parish, becoming curate at Newcastle, also in northeastern New Brunswick. Once there he applied for readmission to the Congregation of Holy Cross and initiated publication of Chez les anciens Acadiens: causeries du grand-père Antoine. In publishing the first book to deal with Acadian folklore, he obviously sought as author to preserve traditions so that future generations would not be cut off from their roots. Even though it lacks the references to dates, places, and sources that would now be required, it paints an authentic, if incomplete, picture of everyday life in the 19th century. Grandfather Antoine – his storyteller – becomes the equivalent of the informant being interviewed by an ethnologist, microphone in hand. In 1911, readmitted to the Congregation of Holy Cross and back at the College of St Joseph, Bourque enthusiastically resumed the musical work he had begun 30 years earlier. In the autumn he even composed another song, “Le gondolier,” which, however, had none of the patriotic character of his previous works. It would be his last composition. He was unable to complete the 1913–14 academic year. After a few weeks in a Moncton hospital, he died in the college’s infirmary on 28 June 1914. André-T. Bourque’s Chez les anciens Acadiens: causeries du grand-père Antoine was issued at Moncton, N.B., in 1911. Chapters from it have since been reprinted in various newspapers and anthologies. A critical edition of the entire work was published by Lauraine Léger at Moncton in 1994. Among Bourque’s other writings, the following should be noted: “Aux Indes orientales: notes de voyage d’un missionnaire acadien,” Le Moniteur acadien, 25–29 mars, 5–12, 22–29 avril 1892; “Chants acadiens,” L’Évangéline (Moncton), 31 août 1910: 4; and “Le rév. Ph. F. Bourgeois, c.s.c.,” L’Évangéline, 9 avril 1913: 4–5. Scores for some of Bourque’s musical compositions were issued separately: Salut! Frères, salut! Cantate aux anciens élèves réunis pour la célébration des noces d’argent du collège Saint-Joseph, Memramcook, 26 juin, 1889 (Saint John, 1889); Plainte et pardon (Montréal, s.d. ); La Marseillaise acadienne (Montréal, 1910); Le pêcheur acadien (s.l.n.d. ); and La fleur du souvenir (Montréal, s.d.). Most appeared as well in contemporary newspapers. The words to “Évangéline” were first published in Le Moniteur acadien, 12 mai 1910: 6. All of Bourque’s compositions have been included in various collections of songs. “Le gondolier” may be found in Chants populaires des Franco-Américains, sous la direction d’Eusèbe Viau et J.-E. Philie (12v., Woonsocket, R.I., –38, and subsequent “éditions” [reissues]), 4 (3e éd., 1945): 2–7. Arch. des Pères de Sainte-Croix (Montréal), Bourque à Georges Dion, 29 août, 11 oct. 1910; 30 juin 1911. Centre d’Études Acadiennes, Univ. de Moncton, Bourque à Stanislas Doucet, 24 janv. 1910; Fonds Placide Gaudet, 1.66–1; Fonds Pascal Poirier, 6.1–4. A. R., “Sur les bords du Gange: une entrevue avec un missionnaire,” L’Évangéline, 4 oct. 1923: 1. Amicus, “Les Causeries du grand-père Antoine,” L’Évangéline, 18 oct. 1911: 5. L’Auteur des “Propos divers,” “Salut! Frères, salut!” Courrier des Provinces maritimes (Bathurst, N.-B. ), 4 juill. 1889: 3. Louis Des Roses, “Le rév. père André-T. Bourque,” L’Évangéline, 12 juill. 1923: 3. J.-O. G., “Chez les anciens Acadiens,” L’Évangéline, 11 oct. 1911: 4. Philemon, “Échos de la baie Ste. Marie,” Courrier des Provinces maritimes, 3 sept. 1885: 3. Rusticanus, “Au Bengale: nouvelles du révérend père André T. Bourque, missionnaire acadien,” Le Moniteur acadien, 29 sept. 1893: 1. L’Acadie des Maritimes: études thématiques des débuts à nos jours, sous la direction de Jean Daigle (Moncton, 1993). Anthologie de textes littéraires acadiens, Marguerite Maillet et al., édit. (Moncton, 1979), 296–306. P.-F. Bourgeois, Vie de l’abbé François-Xavier Lafrance, suivie d’une courte notice biographique de l’abbé François-Xavier Cormier . . . (Montréal, 1913). Étienne Catta, Le révérend père Camille Lefebvre (1831–1895) et la renaissance acadienne (3v., [Moncton], 1983), 1322–23. Marguerite Maillet, Histoire de la littérature acadienne: de rêve en rêve (Moncton, 1983). Pascal Poirier, Le père Lefebvre et l’Acadie (Montréal, 1898). Lauraine Léger, “BOURQUE, ANDRÉ-T.,” in Dictionary of Canadian Biography, vol. 14, University of Toronto/Université Laval, 2003–, accessed April 22, 2019, http://www.biographi.ca/en/bio/bourque_andre_t_14E.html. Title of Article: BOURQUE, ANDRÉ-T.